This post was originally published in February of 2013, shortly after I returned from South Africa. I’m currently off on another adventure, and I decided now would be a great time to go through the archives and share an old favorite post from my travels. Of course, it’s impossible to pick a favorite – our trip to South Africa was such an amazing experience, I’m not sure the blog posts I wrote then even did it justice. 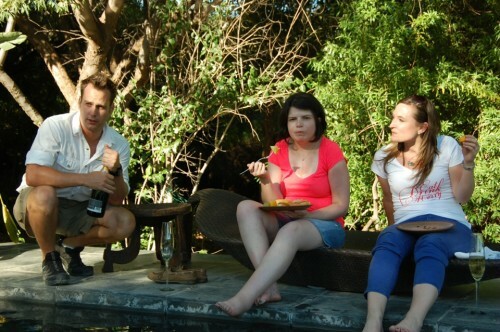 But I knew it had to be the Kloof, and the story about our long drive there always makes me smile. Anyway, if you want to read more, my post about the Aquila Safari and Robben Island were the other contenders to be reposted. Maybe I should just take a few weeks off from writing new blog posts and share all of my South Africa posts again! I mulled it over, and decided she was probably right, and told her the story about the time my mom and I almost got thrown off a train in Italy (I don’t think I ever actually blogged about it, but it’s definitely the best story from that trip. *) She told me a story about accidentally entering a sailing competition in Mexico. We both laughed. It’s funny when things go wrong! If you haven’t already guessed where I’m going with this, this is the post about the day in South Africa when things went wrong. 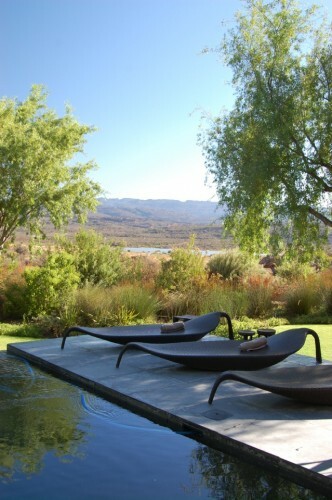 After our week in Cape Town, we were headed up north to Bushman’s Kloof, a resort in north South Africa. Depending on who you ask, it’s either the best hotel in the world or the best hotel in Africa. Joel’s boss had arranged transport from Cape Town, so early Monday morning, we checked out of our hotel and boarded a luxury bus for what was expected to be a four hour drive. I’ll start this by saying I had no idea the drive would be that long – I figured it would be a couple of hours, tops. But I had a fully charged iPad and some snacks, so we settled in. About an hour outside of Cape Town, the driver pulled over at a rest stop. Rest stops in South Africa do not have bathrooms or coffee or vending machines. We happened to be at a nice one with a picnic table and some shade. The bus driver called for a back up — from Cape Town. And we waited at the shaded rest stop in The Middle Of Nowhere, South Africa for the next hour. Finally, we were rescued by a much smaller and less luxurious van. We asked the driver to stop at the next rest stop we came to (the kind with a toilet, I mean.) And we did. After another hour of driving. Here’s our private pool at the lodge. Since we arrived much later than we expected to, tea was all laid out for us. The house manager, Malcolm, on the left here, asked if anyone would care for something to drink – tea or coffee or maybe sparkling wine? Yes, sparkling wine, please. We ate with our feet in the pool. 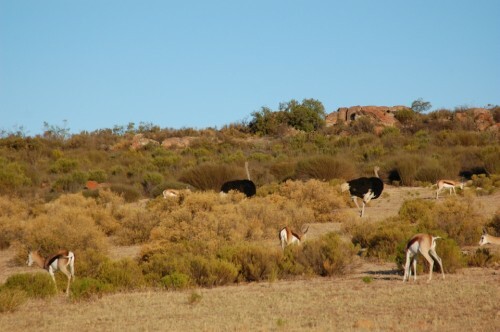 We had time for a quick game drive (and more drinks) before dinner, and we spotted this group of springbok and a couple ostriches. The ostriches kept pretty well hidden at the kloof, so we were glad to have seen them. Also — they are HUGE. I’d guess about 8 feet tall, from feet to head. 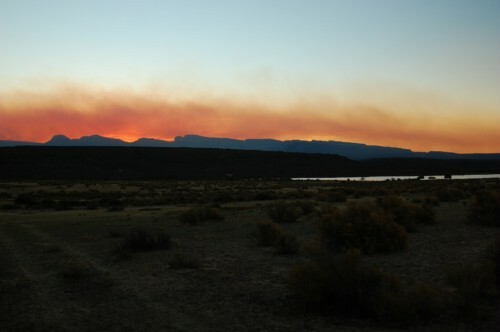 We saw some spectacular sunsets at the kloof, and the first was the best. There was a huge wildfire just a few days before (it had actually gotten to the edge of the resort and all the guests had to be evacuated.) Thankfully, it burned out/was put out in the night, but the lingering smoke made for this beautiful sunset. *Edit to add: I finally blogged about nearly being thrown off the train in Italy. Click here to read the post.